This is my first thread on here. I joined after finding out a lot of information and saving hundreds of $$$ with your tips & knowledge. So thank you! For some reason I got into my 2003 X5 today and strangely found that the CD player (covered by the woodgrain trim piece) moved up a few millimeters and now there is a gap between the radio head unit and the CD player module itself. Strange! And now the trim piece won't open and close as easy as it did. I tried to push it back down and no luck. Any ideas how this happened and how to get it back down into place? I did try searching first, no luck. 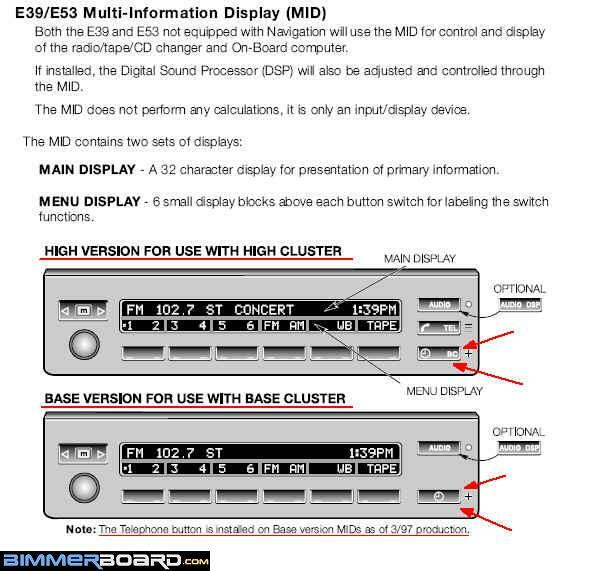 First, the MID is not the head unit...it is just a display control unit that does no calculations of its own. It only receives data from the various components attached to it and designed to be controlled or display their information in the MIDs display panel. The radio is actually incorporated into the in-dash CD player. If you can find a DIY from any e39 or e53 (they use the same set-up and units)...you can see how the in dash CD/radio unit is attached to the dash....but the MID needs to be removed first to access the screws that hold the CD unit in. If the door/panel isn't operating correctly...it's probably due to the in-dash ( probably a CD53) being in the way since you describe it as sitting higher up than normal. Last edited by Qsilver7; 06-20-2015 at 06:03 PM. Wow! Thanks for all of that information. I took it all apart as the video showed. You need a very skinny T10 TORX screw to get it out. The problem was that someone before me had messed around with the radio and didn't properly put it back into place. The Multi Information Display actually has a top edge/lip that sort of clips OVER the bottom lip of the CD unit. Then both units have to be pushed back into place as far back as they will go. This could also cause trouble for people having the CD player cover not closing. Everything needs to be in the right place. Thanks for posting back that you got a chance to resolve the issue...as well as provide more info.